So simple and yummy for summer! Have you seen the corn stands in Sunset Park, Brooklyn? Sold by women out of shopping carts, you get an ear of corn and a variety of toppings are available. Aside from butter, there is mayo (then rolled in a crumbly white cheese), hot sauce, salt, pepper, and lime. Interesting to see so many combinations! I first tried grilled corn in Baguio when I was little. It’s been a consistent top-10 placer in my list of favorite street food. Corn has such a comforting, sweet flavor that is concentrated and made more complex by grilling. WAXY corn or maise malagkit, is a corn variety with grains that have a waxy appearance when cut, and that contain only branched-chain starch. It is grown to make special starches for thickening foods. SWEET or “green” corn, sold along Katipunan or Sta. Rosa, Laguna, is eaten fresh, canned, or frozen. It is a type of corn that is grown in many horticultural varities. It is variously considered a distinct species (Zea rugosa), a subspecies (Zea mays or mais rugosa) or a specific mutation of dent corn. It is distinguished by kernels containing a high percentage of sugar in the milk stage when they are suitable for table use. You can also eat the corn without cooking it as Rachel Sweet said. Once after purchasing freshly harvested sweet corn from an organic farm, I noticed a farm help digging his teeth into an ear just plucked from the stalk. I always thought corn had to be cooked. I didn’t wait to get home and did the same thing. I’ve never tasted corn so sweet and tender! At home when I boiled the corn, briefly, 6-8 minutes or so with a couple layers of husk and the cornsilk with it, it was still good but not quite the same as the raw freshness of it. You know if you dont feel like grilling that day, I have found that microwaving actually work really well on corn, 6 minutes on a plate with a tiny bit of water and it is great! I even have these corn holders that you can put on before you microwave and it doesnt get hot when you are ready to dig in! Thoroughly wet a paper towel then wrap around a fresh picked corn. Stick in the microwave for 2-3 minutes. Voila! talk about fast, hassle free and tasty treat. 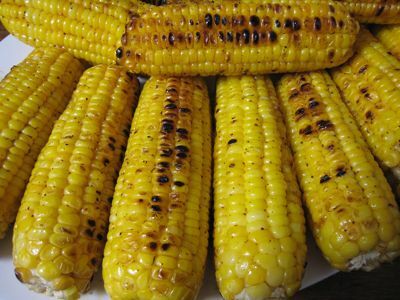 I also like grilled corn but I prefer grilled native corn (the white one) though hard to find nowadays. I also love boiled corn (plain or as ingridient in beef nilaga) and the pinoy corn soup. I said Pinoy Corn Soup because my grand mother used to prepare corn soup, made of grated white corn with shrimps (I can’t remember but I know it’s shrimp)and leaves of sili. That soup is not thick and very delicious. Thanks MM! I love grilled corn. It brings back childhood memories when our maid would bring me some grilled native white corn from the market when she does the weekly food purchase. My lola used to make pinoy corn soup with pork bits fried till crunchy (like chicharon) and ampalaya leaves. Yum! heeheee … just check your teeth before you smile after chompin’ on all that ‘corny’ goodness!! I grew up with the white, sticky, native corn and i can eat 4 pcs all by myself. Boiled, grilled, in corn soup with sauteed garlic, onions, fish sauce, and sili leaves thrown on. Comfort food. Around December…summer time here in NZ – that’s when sweet corn are in season here.I love love love corn!! !MY family got a habit of going to the beach on weekends – around 40 minutes drive and have bbq at the beach.We cook our corn with skin on with our portable gas bbq.The skin keeps the moisture in and its sweetness.YUMMY!When cooked,peel off skin and put butter and pepper…NICE!Cant wait for next summer. i tried this combination once at a friend’s house: grilled corn + green salad + nachos with salsa + freshly squeezed OJ. it was a yummy, healthy meal! I will definitely try your version with paprika and chili powder. thanks!